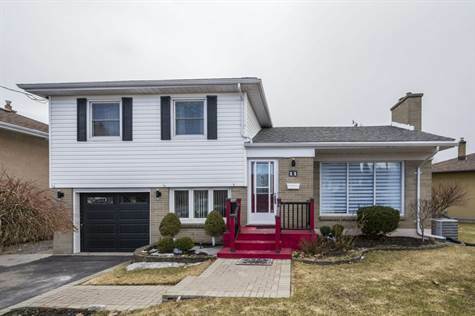 Extremely well maintained & updated multi-level home in desirable area of Belleville. Located on dead end street. Open concept kitchen, living room and dining room area. Updated kitchen cabinets, counter tops & sinks with stainless fridge, stove, dishwasher and built in microwave. New flooring in kitchen. Beautiful hardwood floors on mail level dining room and living room. Gas fireplace in living room. Walkout to huge deck, patio area and fully fenced backyard. Three bedrooms up and full bathroom with air jet tub. On third level, family room & two piece bath plus entrance to extra deep garage with inside entry/steel door, newer garage door with garage door opener and 2 remotes. Fourth level laundry area with some materials being left for rec room finishing plus stand up shower (still in box) but will not be installed. Updates include windows, shingles, furnace, fireplace, deck, fencing, BBQ cover area, and some flooring. 2nd electrical panel installed when kitchen was redone.